Protease inhibitor cocktail is used in cell lysates or tissue extracts to increase protein stability. Endogenous proteins are produced and removed in a balanced state, so their cellular levels are generally stable under stable environmental conditions. However, protein production is greatly halted and degradation is enhanced when cells are studied in vitro. To prevent the degradation of proteins under such conditions, one can utilize a cocktail of inhibitors of those enzymes known to be present. Protease inhibitor cocktail is used in cell lysates or tissue extracts to increase protein stability. The cocktail functions to inhibit proteases that would degrade either phosphorylated or non-phosphorylated protein substrates. 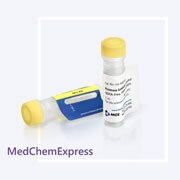 Protease inhibitor cocktail has been optimized and tested for mammalian cell and tissue extracts. 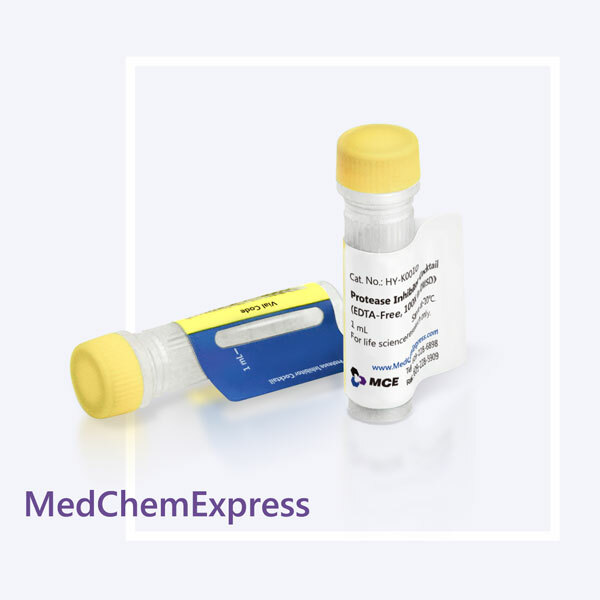 It contains inhibitors with a broad specificity for serine, cysteine, and acid proteases, and aminopeptidases. This cocktail is supplied as a ready-to-use solution in DMSO. • Cell . 2019 Mar 6. pii: S0092-8674(19)30202-8. • Cancer Cell . 2017 Nov 13;32(5):561-573.e6. • ACS Nano . 2019 Mar 26;13(3):3555-3572. • Curr Biol . 2018 Sep 10;28(17):2763-2776.e6. • Cell Rep . 2019 Mar 12;26(11):2984-2997.e4. • J Exp Clin Cancer Res . 2018 Nov 28;37(1):292. • Mol Ther Nucleic Acids . 2019 Mar 1;14:90-100. • Mol Ther Nucleic Acids . 2018 Sep 7;12:769-786. • Cell Death Dis . 2018 Mar 16;9(4):416. • Cell Physiol Biochem . 2017;44(3):1051-1063. • Biotechnol Biofuels . 2019 Feb 21;12:38. • J Biomed Nanotechnol . 2019 Apr 1;15(4):790-798. • Nanomedicine (Lond) . 2018 Jul;13(13):1517-1533. • Eur J Med Chem . 2019 Apr 1;172:174-185. • Eur J Med Chem . 2018 Mar 25;148:372-383. • J Immunol . 2019 Apr 12. pii: ji1801199. • J Cell Mol Med . 2019 Jan;23(1):155-166. • Biochem Pharmacol . 2018 Sep;155:198-206. • Sci Rep . 2019 Jan 29;9(1):907. • Sci Rep . 2018 Oct 25;8(1):15788. • Sci Rep . 2018 Jul 2;8(1):9963. • J Biol Chem . 2018 Nov 23;293(47):18328-18336. • Allergy Asthma Immunol Res . 2017 Mar;9(2):142-151. • Eur J Pharm Sci . 2019 Mar 26. • Biomed Pharmacother . 2018 Jul;103:746-754. • J Agric Food Chem . 2018 Jun 27;66(25):6402-6413. • Virology . 2019 Feb.
• Cell Biosci . 2018 Feb.
• Int Immunopharmacol . 2019 Jan;66:236-241. • Int J Mol Med . 2018 May;41(5):2784-2792. • Neurochem Res . 2018 Oct;43(10):2008-2015. • Onco Targets Ther . 2018 Jun 15;11:3461-3473. • Biochem Biophys Res Commun . 2017 Apr 8;485(3):577-583. • Virol Sin . 2018 Dec;33(6):545-556. • Virol Sin . 2018 Nov.
• Biotechnol Lett . 2018 Apr;40(4):641-648. • Oncol Lett . 2016 Aug;12(2):977-982. • Int J Ophthalmol . 2018 May 18;11(5):712-718. • Open Medicine . 2019 Jan. The product should be stored at -20°C, and is stable for at least 12 months. Thaw at room temperature, add at 1:100 (v/v) dilution to solution samples (such as cell lysates or tissue extracts), before assaying.